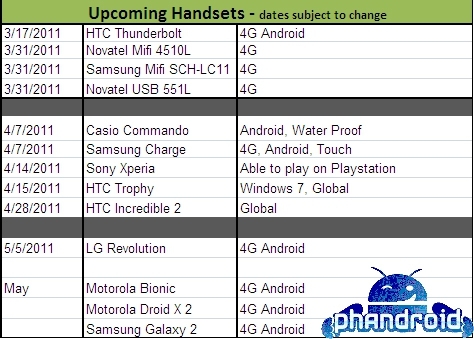 "A friendly neighborhood tipster has sent along Verizon's upcoming roadmap for their Spring releases..."
Phandroid has acquired Verizon's spring handset release roadmap. Of importance to us Windows Phone enthusiasts is the device slated for release on 4/15/11. That's right, the HTC Trophy, Verizon's first WP7 phone. With this impending release, WP7 will soon be available to buyers on all four U.S. carriers.